Across the bay from downtown Pensacola is Fort Pickens. Pensacola, Florida, has a rich history dating back to the Spanish explorers. Across the bay from downtown Pensacola is Fort Pickens, located along a four mile stretch of the Gulf Islands National Seashore and the Gulf of Mexico. On the Bay side you can easily see Fort Barrancas, the Pensacola Lighthouse and Perdido Key. I had never been to Fort Pickens and used the excuse of finally buying a senior National Park pass as a reason to visit. Fort Pickens is one of those must-see places along the Gulf Islands National Seashore, especially if you are a history buff or photographer. 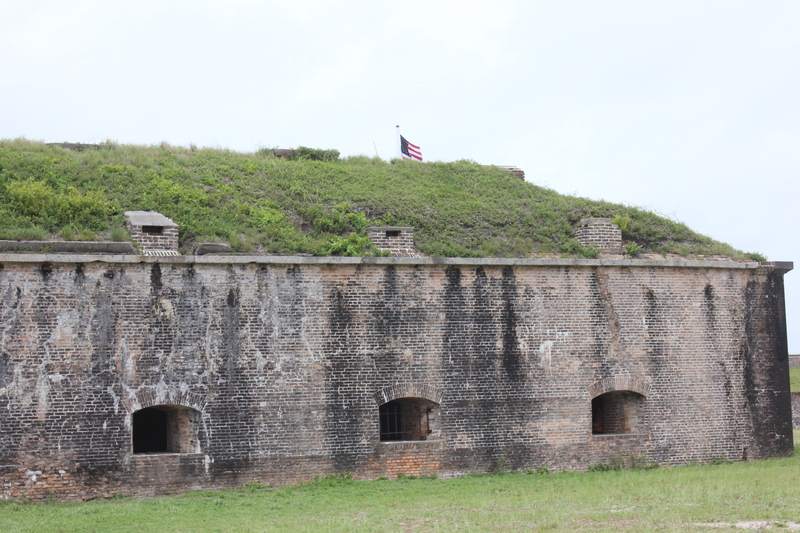 Also, because of the Fort’s precarious location along the Gulf it receives the most damage during Tropical storms or hurricanes. I wanted to visit before the National Park’s road became impassable for a long time or forever. It was overcast the day a friend and I visited Pensacola Beach and Fort Pickens, as a storm had recently passed through. Yellow flags flew at the edge of the beach, warning swimmers to be cautious. One look at the large, heavy waves and I wondered who would endanger themselves by entering the strong surf and dangerous undertow, especially as that area, away from the condos and restaurants, had no lifeguards. Further along the road we encountered signs warning that it was nesting season for the Snowy Plover, advising vehicles to drive very slow. The dainty white birds screeched and flew above their nests, worried about the careless humans coming too close. After passing many camping areas we finally came to the end of the road and saw the Fort. Considering it was built in the early 1800’s and its location close to the Gulf waters, where it is continuously beaten by the elements over the last (almost) two centuries, it is amazing anything is still standing. We opted to tour the brick Fort and leave the museum for another time. There is a flyer you can grab on the way into the nearest building from the parking lot so you can do a self-tour. But we had so many questions by the end of our explorations, that it would be smarter to return another day for the 2:00 p.m. guided tour. While walking through the dark cobbled-floored rooms we came across two narrow corridors that were split in the middle in a “V” shape. The two corridors, each going away from each other like the sides of a triangle, were low, narrow and seemed endless, begging the question, what was their purpose? There were only women around and female children, no men or adventurous boys who would normally investigate. Looking at the pamphlet afterwards we found out the corridors were designed to hold one-thousand pounds of gunpowder, which could be blown as a last resort to defend the fort. There were also diamond-shaped vents in the ceiling above each gunroom. We can only assume they were used to vent the smoke from the ammunition but that’s a question for another visit. 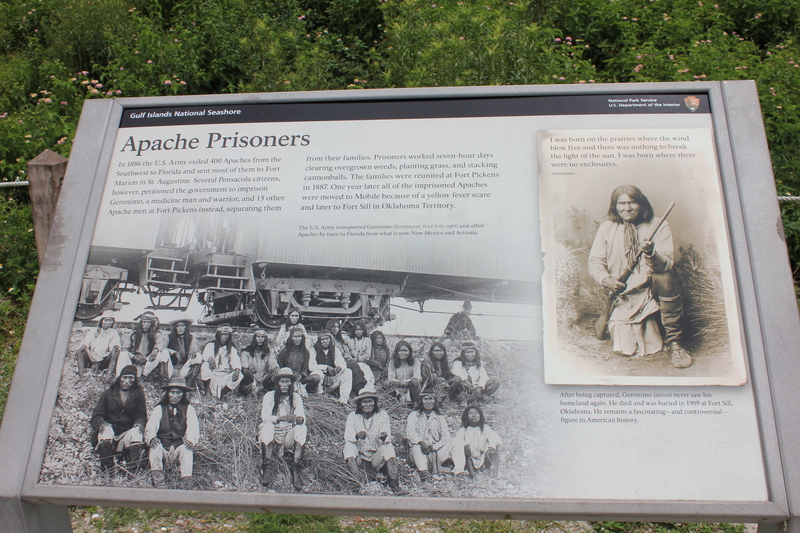 I had forgotten that Fort Pickens was the location where Geronimo and his men were held prisoner. It was considered a way of bringing fame and the public to the Fort to see the notorious Indians. Although everyone may have a different opinion I felt embarrassed reading the sign above, thinking about the humility these remaining Native Americans suffered. Their woman and children were sent off to another location but eventually returned to Geronimo and his men, only to be moved to Oklahoma where Geronimo died. 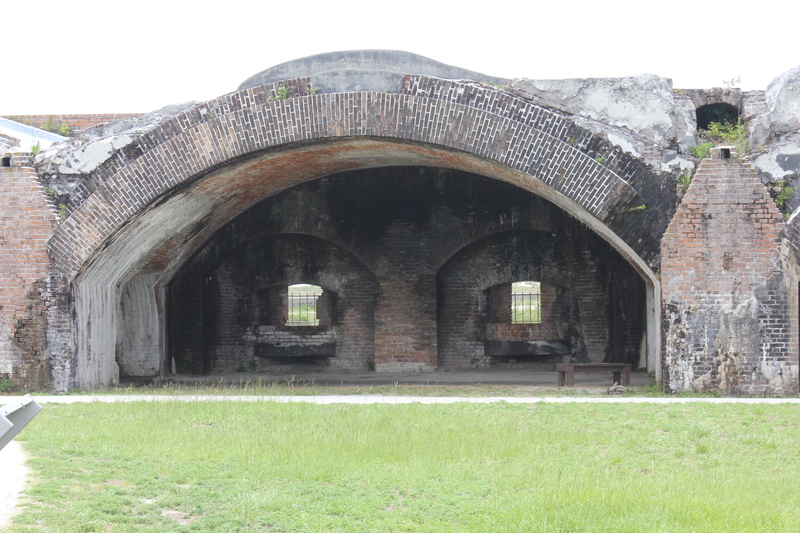 Although up close this looks like a kitchen with a vent in the roof, it is where cannons were located to shoot out into the Gulf. The series of open rooms were designed using a reverse arch, which spread the weight of the entire structure to minimize settling in the sand. The 21.5 million bricks to make the entire Fort Pickens were made locally and barged to the location. At one point we walked up a steep set of brick stairs to the roof where two cannons were on display. The heavy cannons could be directed in three directions, west, south and north to ward off the enemy. I assumed that the Confederates maintained the Fort during the Civil War but, in fact, the Union soldiers took control, fired on the Navy yard and eventually took control of Pensacola. The visit to Fort Pickens will require two returns, one to visit the museum and catch the guided tour of the Fort and another time to wander the grounds and take pictures of the endless blue sky and choppy waves in the Gulf of Mexico or walk along the Pensacola Bay side. The Snowy Plovers fly effortlessly in the wind along the National Seashore. I’d like to take a picture of them as well as the pristine dunes and the leafless, battered trees with their branches twisted in odd directions. Afterwards, there are many restaurants to explore back at Pensacola Beach. This entry was posted in Florida, Fort Pickens, Retirement Life and tagged Fort Pickens, Pensacola Beach Florida, retired life, Snowy Plover. Bookmark the permalink.